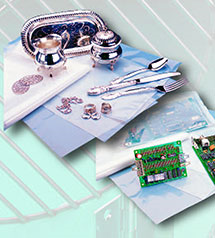 Technology Packaging's TechCorro™[P] Silver products are especially formulated to protect silver and other noble metals from tarnishing and corrosion. The leading cause of silver tarnish is hydrogen sulphide and TechCorro™[P] Silver protects against this even when this is accelerated by industrial plants emitting these as byproducts of production. The special formulation in TechCorro™[P] Silver can be added to paper and film so the choice of packaging/protecting material is up to you. TechCorro™[P] Silver is stocked in rolls 914mm x 182.9m. TechCorro™[P] Silver also can be provided in bags. It can be provided in bespoke sheets and rolls if required, please ask our sales team.